We’re sure most if not all of you have heard of Julien Fournie by now, thanks in part to his much talked-about collaboration with popular local blogshop Love Bonito. Whilst most of the spotlight has been on the collaboration, we now turn our attention to the man himself. The designer oozes a sense of passion and charisma that is undeniably French, complete with hugs and air kisses after the interview. He also takes out his iPad several times as we speak, eagerly showing me some of his sketches and asking what I think about them. Despite his recognition and success, it’s pretty clear that the designer has no airs and wishes to share his love for fashion with everyone. We’re also really grateful for the fact that he took time to speak to us despite his ultra busy schedule, having to rush off to a fitting right after the interview. Read on to find out about what he studied before getting into fashion (you’ll be surprised! ), his thoughts on working with the Love Bonito girls, and his inspiration for his own haute couture collection. Rebecca: You actually studied medicine and biology in the university. How did you make the transition to fashion? Julien: It was actually very easy, because I knew a fashion journalist. When I was in the faculty my best friend’s mother was a fashion journalist. And because I am a good illustrator, she saw the sketches I made, and she organized a meeting with me. Rebecca: Did you actually wish to get into fashion from young? Julien: Yes, I started drawing and sketching when I was very young. My grandmother was a corsetiere, and my grandfather on the other side was a leather maker in Morocco. Also, my father played guitar and I played the piano, and since young my parents brought me to exhibitions and the cinema. So creativity kind of runs in the family. But because I was very good in my studies, they pushed me to enter medicine school. But the day I met this journalist, that very night I had a meeting with my parents, and I said “Ok, I want to change my life”. So that’s when I started my career in fashion. Rebecca: What did they say? Julien: They said “For what? You don’t like medicine? You want to do something in biology?”. I said “No, I want to become a fashion designer.” They said “Ok, but you have to improve that”. They are my first fans. My parents always support me, they are always behind me and are very proud of me. And we’re a tiny family, because I have no brothers or sisters. Sometimes it’s difficult, because parents tend to pressure you. You have to be the best, you have to be perfect. But it’s good because they really pushed me to excel, and it’s because of them that I have a really strong work ethic. Rebecca: So tell us more about your collaboration with Love Bonito. Julien: I hope that lots of young women would love it. I started the Love Bonito collection two months ago, at the end of August. It will be in the e-shop about 2 months after the show. I designed a collection which I hope is wearable for everyone. It’s very feminine , it’s easily accessible, and its veered towards an Asiatic attitude. It’s really a cutesy collection for young ladies. We have lots of amazing prints too, developed by my best friend who’s a painter and has worked on all my haute couture collections. I would call the collection a big bundle of creativity and love. Because when I met Rachel and Viola, that’s what it was. A big bundle of love. So I want to show that. Rebecca: Which brings me to my next question. What was it like working with Rachel and Viola? Julien: It was so easy. They know the market, they know about development, the fabrics, the customers. We did it in 2 days, around the table. And you know the love Bonito collection is very different from designing haute Couture. I sketch, and I ask “What do you think about that?”. If Rachel’s not really into it, it’s ok. I’ll make another sketch, and they’ll tell me the ones they love. They bring lots of fabric, and we chose the ones we wanted. It was a very quick and smooth process. Rebecca: Why do you think you guys work so well together? Julien: Because there’s quite a good balance. I just want to make a beautiful collection for Love Bonito. It’s the best way to create fashion addicts, and have people go “I want that!”, you know what I mean? And as for the girls, they know the market so well, so it’s really easy to work with them. Rebecca: How do you actually bridge haute couture and street fashion? Julien: Haute couture is pretty much research and development all the time . It’s a long process. And I’m really into innovation, so for me haute couture remains a piece of art and research. And of course this way of thinking has an impact on my creativity and my way of thinking for Love Bonito. Let me explain. Imagine a cell. Inside the cell you have a nucleus. The nucleus is haute couture. And around the nucleus you have atomic things, like ready-to-wear, fast fashion, accessories, shoes, makeup, fragrances, a lot of things. So haute couture is like the center through which you can pretty much design anything, with street fashion being part of that. Rebecca: So a lot of high-fashion brands are actually collaborating with street labels such as H&M. Why do you think such collaborations are so popular? Julien: These big brands remain very expensive. I’m sure designers and brand would love to share their passion for fashion with more people. So fast-fashion or ready to wear or e-commerce could be the best way to share emotion through garments. It’s also a way for high fashion to be more accessible. You could chose stay in haute couture, and cater to customers of a certain kind. But you could also reach out to the young girls, who would love to get their hands on just a few pieces of Julien Fournie. So I can in a way ‘make her dreams come true’. I want to share my passion for fashion and creativity with everyone, particularly ordinary girls because they are allowed to dream too, you know. The most beautiful present for me would be to cross the street and see a woman wear a Love Bonito piece. Rebecca: Let’s talk a little about your own collection. I notice it’s a lot darker than last year, but also very regal. Tell me more about your inspiration for that. Julien: Yes, it certainly is darker. First of all, I think I’ve become an adult, so it’s kind of a turning point in my own life. This collection is actually based on Chimera-it’s sort of a mutation between a woman and a lion. And I was inspired by that for the colours, you can see quite a lot of animalistic influences. In fact, two big artists inspired me for this collection. One is Amedeo Modigliani, because he is a famous painter who elongates bodies, and it’s my obsession to elongate bodies. As for the colours, my inspiration comes from Gustaf Clemens. Rebecca: What kind of women do you picture when you are designing? Julien: For this collection, definitely Nicole Kidman. She’s so graceful and feminine, and she has the most exquisite shape. I love that. You could imagine her in any dress in my collection. As for personality wise, I usually picture strong women who are not afraid to reveal what they are, and yet have a certain vulnerability as well. Rebecca: Who would you like to collaborate with in the future? Julien: Definitely Mark Ryden, you have to see his work, it’s very beautiful. He’s really an amazing painter and illustrator. 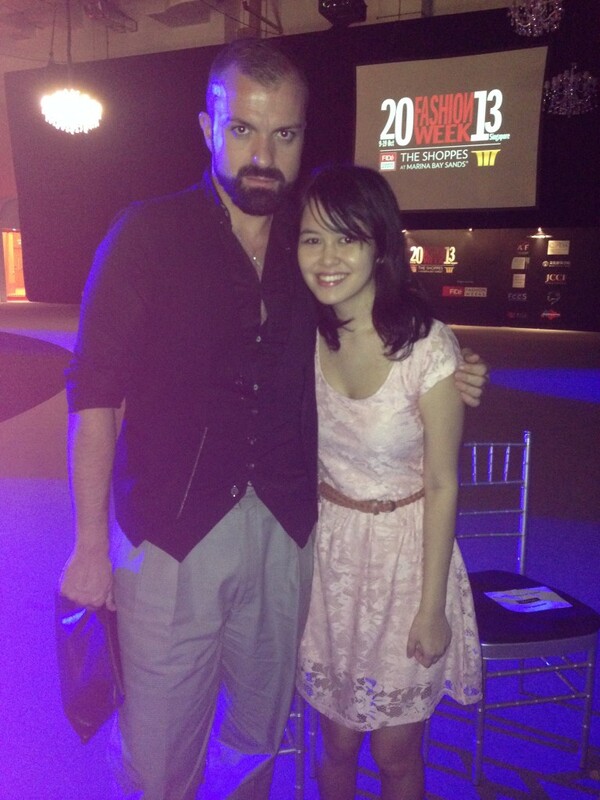 Rebecca: Any designers you find particularly interesting at Fide Fashion Week? 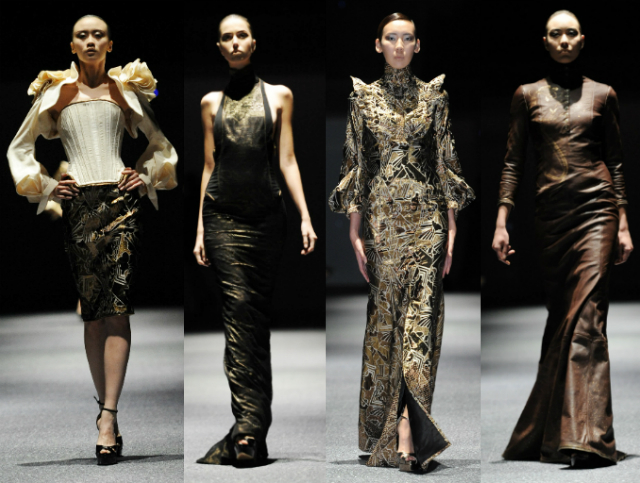 And do you feel that Asian designers are gaining more recognition worldwide? Julien: It would have to be Yumi Katsura. Her collection just blew me away. And there are lots of amazing Asian designers like Kenzo and Yohji Yamamoto. So Asian designers have already made their mark in the fashion world. Rebecca: Last question! Could you pick a favourite piece from both the collections? Julien: From my haute couture collection there is this mermaid dress with sequins that I really love. When you touch the dress, you can change its colour and it becomes either gold or black. As for my collaboration with Love bonito, it would have to be the colour block jumpsuit. I love it!